Lear et Cordelia. 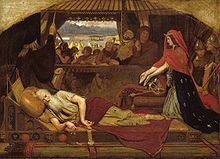 Pictura a Ford Madox Brown facta: Lear rex, a maioribus filiabus expulsus, liberatus a filia minima, earum veras noscitat naturas. Anagnorisis (Graece ἀναγνώρισις 'recognitio; patefactio') est discrimen in ludo scaenico aliove opere positum. Primo significat cognitionem vel recognitionem personarum inter se, velut Orestis et Electrae, Ulixis et Penelopae etc. Aristoteles et Platon anagnorisin latius intellegi volunt: ἐξ ἀγνοίας εἰς γῶσιν μεταβολή ('mutatio ex ignorantia in scientiam'), qua non solum apud dramatis personam circumstantia rerum subito inlucescit, qua patefactione rei opertae argumentum fabulae enodate ad exitum pervenit. ↑ Aristoteles, De arte poetica 1452b. Frye, Northrop, 1963. Myth, Fiction, and Displacement. Fables of Identity: Studies in Poetic Mythology. Harcourt, Brace & World. Novissima mutatio die 13 Decembris 2018 hora 13:41 facta.